The Battle of the Dunes, fought on 14 June (Gregorian calendar), 1658, is also known as the Battle of Dunkirk. It was a victory of the French army, under Turenne, against the Spanish army, led by John of Austria the Younger and Louis II de Condé. It was part of the Franco-Spanish War and the concurrent Anglo-Spanish War, and was fought near present-day Dunkirk. The 18,000 French supported by 3,000 troops from the English Commonwealth besieged Dunkirk's garrison of about 3,000 in May 1658. A Spanish army of about 15,000 men was divided in 2 corps, the Spanish Army of Flanders on the right and the small corps of French rebels, of the Fronde, on the left under the command of Condé. The Spanish corps included a force of 2,000 English/Irish Royalists – formed as the nucleus of potential army for the invasion of England by Charles II, with Charles' brother James, Duke of York, amongst its commanders – was sent to relieve the town. Leaving some men to continue the siege, Turenne advanced to meet the Spanish army. The battle on 14 June 1658 which resulted from this manoeuvre, became known in England as the Battle of the Dunes because the red-coats of the New Model Army under the leadership of Sir William Lockhart, Cromwell's ambassador at Paris, in Turenne's army astonished both armies by the stubborn fierceness of their assaults particularly with a successful assault up a sandhill 50 meters (150 ft) high a strongly defended by Spanish veterans. The battle lasted for about two hours and ended with a rout of the Spanish forces, who lost about 6,000 killed, wounded, and captured with their opponents losing about 400. The French corps of rebels on the left under the command of Condé retreated in good order. The Royalist Cavalier regiments fighting for the Spanish left the battle in good order when they and the Roundheads agreed not to shed any further English blood on a foreign battlefield. When Dunkirk surrendered to Turenne on 14 June, Cardinal Mazarin honoured the terms of the treaty with Oliver Cromwell and handed the port over to the Commonwealth. In 1657, the efficient diplomacy of the Cardinal Mazarin brings the England of Cromwell in an offensive alliance with France against Spain, the price being the harbour of Dunkirk. The operation of Dunkirk was commanded by the Viscount of Turenne with the reinforcement of 6000 English under Lord Lockhart and a fleet of 18 ships. The campaign started the 14 of May and the 25 the Anglo-French army was beginning the siege of Dunkirk defended by the Marques of Legañez with 800 horse and 2200 foots. The Spanish governor of Flanders (Don Juan José de Austria) reacted slowly and it is not until the 13 of June that a Spanish army, supported by French rebels under the prince of Condé, presented in front of the French positions. It seems that the objective of Don Juan Jose de Austria was not to gives battle because part of his infantry and all the guns were not with him. Well served by his scouts, Turenne decided to leave some troops (3000 – 4000 men) to guards the trench in front of Dunkirk and to march with the rest of his troops to attack the Spanish army. 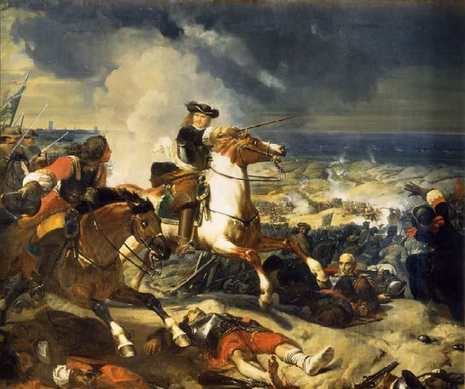 With this manoeuvre the French surprised the Spanish commander who had sent in the early hours of the day, half of the Spanish cavalry to forage nearby the city of Furnes.